It is just a small number coming from a small but dynamic market, Colombia. But in these days of bad news coming from Europe, it is good to know that Fiat cars are doing quite well in a country where competition is getting really hard and the image of Italian cars is not the best. Colombian car market has become one of the most dynamic ones thanks to several factors. First of all Colombia is now facing a healthy economic period that has allowed a larger part of the population to afford its first car. Another important fact to be considered is the devaluation of Colombian Peso, the currency. Now imported cars, 60% of total sales, are no longer as expensive as they were some years ago. For example, 4 years ago a VW Jetta was available starting at US$50.000 and now people can buy paying only US$21.000. Besides current and last Colombian governments have decided to follow the Chilean and Peruvian example in terms of trade. Colombia is now a more open market to investment and free trade agreements. They have signed free trade agreements with Mexico, Chile, Peru, USA, Canada and now are coming the agreements with the European Union and South Korea. Doing so, Colombia is opening its car market to the arrival of cheap imported cars that will better compete with local made Chevrolet, Renault or Mazda. That is why Mexican cars like the Nissan Sentra, Versa, March, or VW Jetta, Dodge Journey, Ford Fiesta, or Korenas such as the Hyundai i25 and i35, Kia Rio, Sportage or Cerato, have become all so popular in this South American country. Last year a record of 325.000 cars were sold over there, up 28%, and this year is expected the same number, allowing Colombia to become the fourth largest of Latin America. 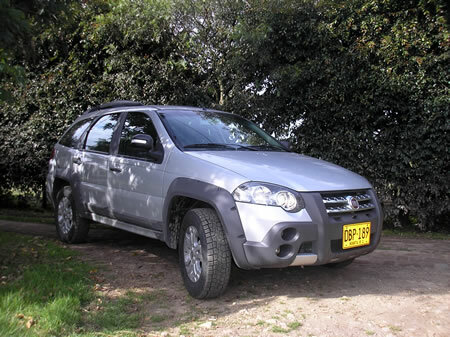 The Palio Adventure Locker is one of Fiat best selling cars in Colombia. It comes from Brazil and offers a good mix of offroad car with the advantage of not being 4WD so it does not pay a lot of taxes. In that context Fiat-Chrysler is doing an interesting job. 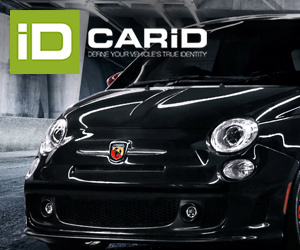 First of all is important to mention that Fiat brand has had a troubled history since it was established some decades ago. In the late 70’s Fiat used to assembly their 147, Mirafiori and some more in their plant in Bogota. The cars were really popular but in the 80’s Mazda bought the plant and the Fiat production moved to Venezuela. After that the representation of the brand has been scattered and has damaged the image of the brand among Colombian users. 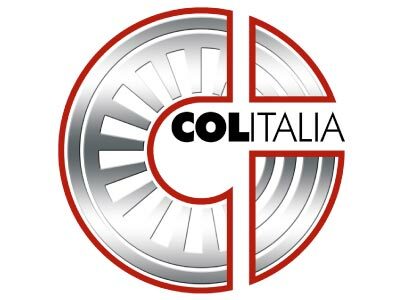 Anyway in 2009 Colitalia Autos, an Italian-Venezuelan company bought the rights of the brand to Autogermana, BMW dealer, and began the best service ever. After some years of hard work looking to regain the trust of Colombians, Fiat is now increasing its presence all over the country in order to catch a part of this important market. They sell the new Uno, Palio, Siena, Strada, Idea, Punto, all Adventures, all coming from Brazil, and the small 500, imported from Mexico. Colitalia is also the official dealer of Alfa Romeo available in Colombia since 2010. The good news is that Fiat brand is up a massive 30% in January-July 2012 thanks to new dealerships all over the country and much better products with interesting prices. They have sold 978 units, from which the Fiat Strada, Palio and Palio Adventure are the most popular. The Fiat 500 is also having a good time in Colombia due to the fact that it does not pay any import taxes as it comes from Mexico. When it was introduced for the first time, in 2009, the Polish 500 started at US$36.000 and today Colombians can buy the Mexican version for only US$20.500. 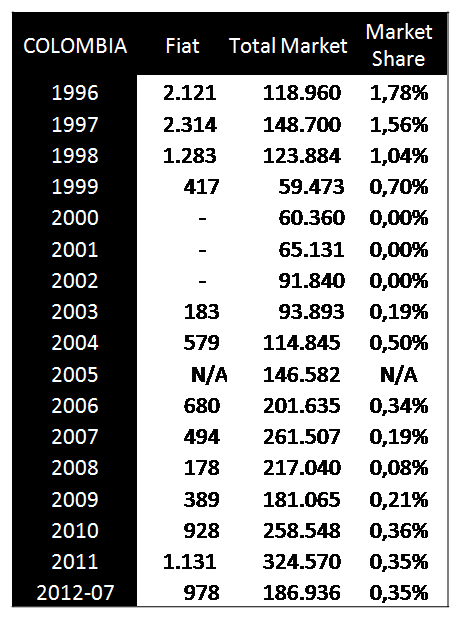 The good result of sales registrations is even better taking into account that Colombian car market has stopped its growth, and is up only 1%, as a response to a decrease of general consumption of Colombians. Fiat can play an interesting role in Colombian market if Colombian economy opens its barriers to Brazilian products and at the same time boost the Mexican products. But Colombia is not the only country where Fiat is doing good. In Mexico, after the launch of the local made 500, the sales of the brand have risen 133% in January-July 2012. Certainly Mexicans begin to love this pretty car and the fact that the brand is now better represented by Chrysler, the fourth largest of the country. 2741 cars have been sold over there. All these sales figures, though they are still small numbers, are good news for a better start to open more markets for Fiat in Latin America, where it is really dependant in only 2 countries, Brazil and Argentina. Mexico, Colombia, Peru and Chile are healthy markets where the presence of the group must be increased and improved.